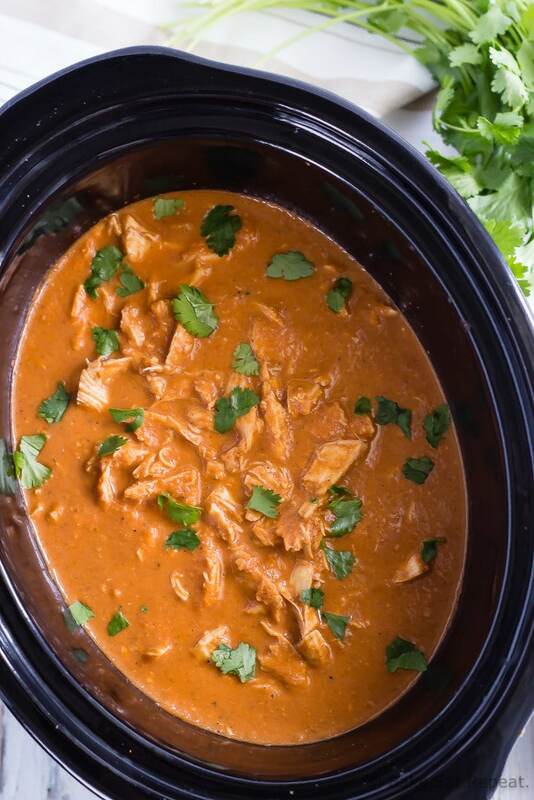 Homemade butter chicken cooked in the slow cooker with an easy to make sauce. It’s the perfect weeknight meal with very little hands on cooking time! Have you ever made butter chicken at home? I actually hadn’t even eaten butter chicken until probably about 5 years ago. Clearly I was not a very adventurous eater up until getting married. I didn’t try Pad Thai until my husband informed me I needed to, and it was the same with butter chicken. He couldn’t believe it when he found out I hadn’t ever tried either of those and quickly remedied the situation by bringing some home as soon as possible. And then of course I realized that both are absolutely delicious and needed to be made at home so that we could enjoy them whenever we wanted. My kids were not convinced quite as quickly as I was that butter chicken is amazing. I will admit that. But let’s be honest, it really doesn’t look that appealing. And the name makes it sound like it’s chicken swimming in butter which is a tad unappetizing. That’s what I thought before seeing a recipe for it and realizing that there really isn’t all that much butter in butter chicken. A couple tablespoons for flavour, but that’s it. This recipe comes together quickly, with just a few minutes to cook up the vegetables on the stovetop, which are then blended with chicken broth and tomato paste for the sauce. The chicken cooks in the sauce so all you need to do is toss it in the slow cooker. There’s a few minutes at the end of cooking time to shred or chop the chicken and you’re ready to eat. 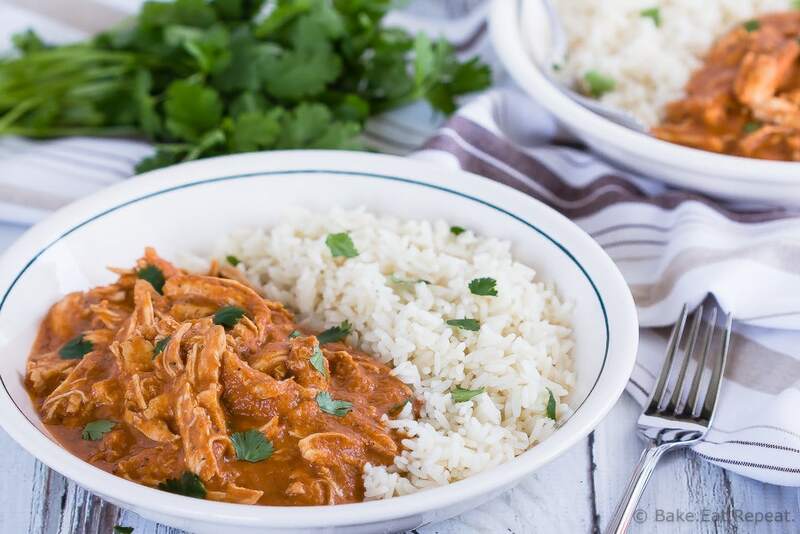 I’m making butter chicken a little too often now that I have a quick and easy slow cooker recipe available to me. Making up for lost time, I guess. Don’t be like me. 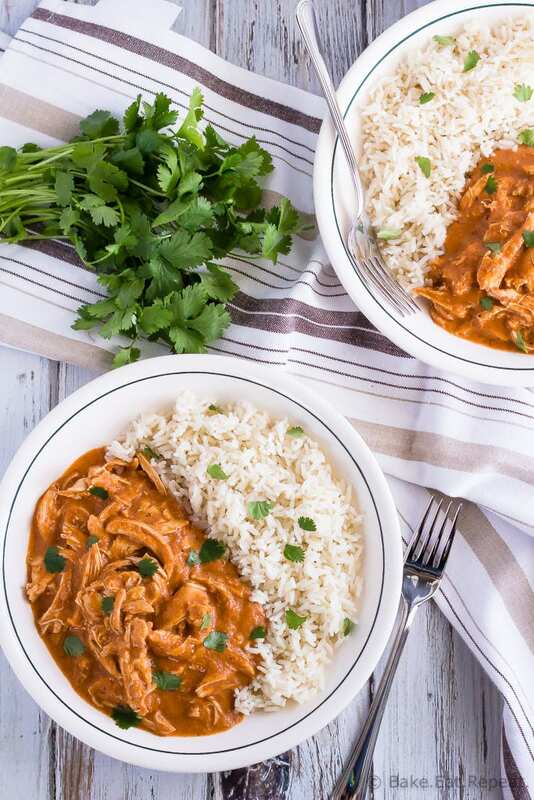 Try this slow cooker butter chicken tonight so you aren’t missing out on the deliciousness any longer! 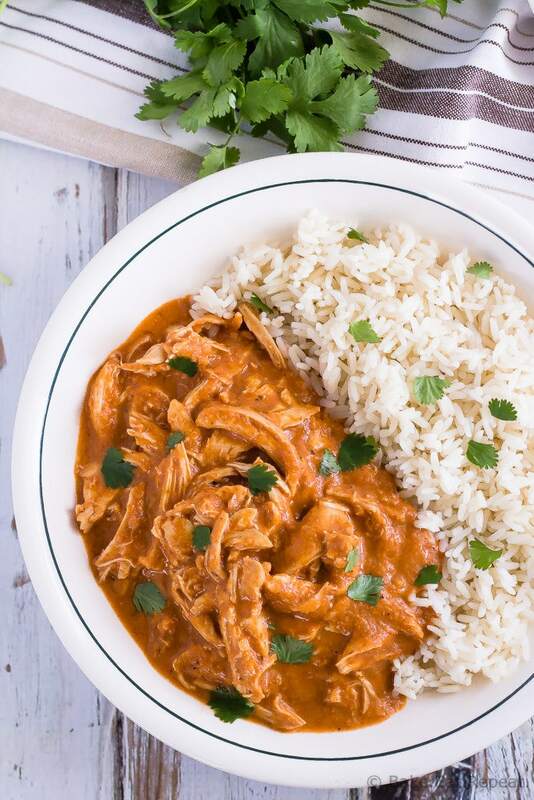 I’ve also shared this Slow Cooker Butter Chicken recipe over on The Weary Chef. Homemade butter chicken cooked in the slow cooker with an easy to make sauce. It's the perfect weeknight meal with very little hands on cooking time! Heat the olive oil in a medium saucepan over medium high heat. Add the onion, jalapeno pepper, garlic and ginger and cook, stirring, for 3-4 minutes or until the onion is softened. Stir in the garam masala, chili powder, cardamom, coriander, salt and pepper and cook for another 30 seconds until fragrant. Remove from the heat and scrape everything into a blender. Add the chicken broth and tomato paste and blend until smooth. Place the chicken breasts into the crock of a slow cooker and pour the sauce over top. Cook on low for 4-5 hours, or high for 2-3 hours, or until the chicken is cooked through. Remove the chicken from the slow cooker and shred it with two forks (or chop it into bite sized pieces if you prefer). Return the shredded chicken to the slow cooker along with the cream and butter and stir to combine. In a small bowl, whisk together the corn starch and water and stir it into the slow cooker. Cook on high for another 30 minutes. Serve the chicken and sauce over hot, cooked rice, garnished with chopped cilantro if you like. You can also chop the chicken before cooking it, and let it cook already cut up in the sauce in the slow cooker, but I prefer to cut it up (or shred it) after it’s cooked as it tends to stay a bit more moist. Also, if you don’t like your food spicy at all, use just half a jalapeno pepper as they sometimes can give the dish a bit of heat even without the seeds. I only use half when my kids will be eating it, although the adults here like a bit of heat! This meal freezes well if you have leftovers, just place it in a ziplock bag or freezer safe container after it cools. You can defrost it in the fridge overnight and then warm it on low in a saucepan or for an hour or so on low in the slow cooker. You can also make just the sauce and freeze it, then proceed with the rest of the recipe when you are ready to use it. Source: Adapted from Mel’s Kitchen Cafe . This post contains affiliate links, meaning that if you make a purchase through these links, I receive a small commission. I love butter chicken. I make it often. But I don't add corn starch for thickening. Instead I add few cashewnuts in saucepan while sauteing the onions and masalas and then blending it. You can strain the gravy to get a smooth gravy too.